We have carved a niche in the industry by presenting a wide range of Electric Chain Hoist. 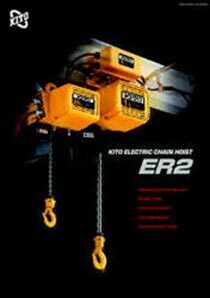 As a Supplier, Exporter and Importer, we proudly present Kito Electric Chain Hoist. We are providing the best range of electric wire rope hoists such as monorail hoist, fixed suspension hoist, cage hoist and single phase electric wire rope hoist with effective & timely delivery. Such a quality is made available at economical rates for our customers. Dual speed inverter delivers smoother movement than ever. Double safety mechanism which consists of Friction clutch and upper lower limit switch.